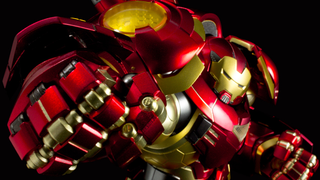 We’ve already gotten a pretty decent look at Sentinel’s Re:Edit Hulkbuster toy in its prototype form, and it looked outstanding then—but this is our first look at the final figure, and it somehow manages to look even more fabulous now. But perhaps what is most impressive about this Hulkbuster is both its ridiculous levels of articulation as well as the fact that such a top-heavy design can manage to stay standing. In fact, I’m half expecting some digital trickery is helping here, but if it isn’t, then it’s kind of an amazing balancing act. Even if you do find yourself needing something to prop this figure up though, the stand included does come with a grip to hold the figure in more elaborate poses—poses that make this giant robot look a little less hulking and a little more like a graceful mecha. But such loveliness comes at a great cost, as is the case with most Sentinel figures—and it’s pretty extreme. Pre-orders for the toy are now available ahead of its January 2016 release, and it’ll set you back a whopping $305. I’m tempted, but that’s a pretty crazy price, even if it is a fantastic-looking figure.